It is necessary to compare videos with each other for effective color correction. There are three methods to complete this task using DaVinci Resolve. One can either access the difference reference modes to visualize the changes between reference clip and timeline clip. One can also use gallery for displaying two different clips and lastly, it is possible to use split screen controls for generating display of multi frame type arrangements. The article below will provide you details about how to compare clips using DVR platform. Step 1: First of all you have to import your media files to the user interface. Step 2: Now you have to select your split screen preset from timeline. Step 3: It is time to add videos to your preset. Step 4: Simply save your split screen video. How to Compare Clips in the same Window? Clips that are saved after processing of so many clips can be easily accessed in the gallery of color page. This page can provide services for browsing various pre-saved “looks” and its comprehensive user interface assists in easy importing, save, organizing and browsing stills. Stills in DVR are saved in DPX file format and when you have saved multiple stills then it is possible to generate split screen wipes in Viewer window. The easy to use interface of DVR provides facilities for saving the stills, for easy wipes, for adjustment of wipes and for easy customization. Gallery of DVR is commonly used to generate wipes against various reference stills. Note that by simply changing this reference mode users can develop wipes with ease against various clips in the timeline as well as against any offline video. For enabling timeline mode, hit the viewer and then move to reference mode, now select Timeline from available options. The active clip appears in orange colour over DVR window whereas reference clip is of blue color. 1. Hit the split screen button available on top portion of viewer toolbar then select split screen technique from pop-up menu, it is visible at right corner of viewer toolbar. 2. Now select one option from view and go to split screen submenu. 3. Right click over viewer and select option from split screen submenu of contextual menu. Versions: display about 16 versions of selected shot in timeline. The 16 versions are actually more than enough and it helps beginners to make easy selection about what kind of final looks they desire for their specific clips under processing. Version that you are using currently will be outlines with a gray box on monitor. Versions and Original: it is almost the same as that of Versions and they are used to show the upgraded clip for the purpose of comparison. Many of you would like to use this display actively during their editing process because it helps them to know about what kind of changes till now your image has suffered. Groups: shows the already discussed 16 clips, they have been manually grouped by editor or colourist. This option will help you to know about the consistency of similar clips in setup. Groups option is commonly used to determine the lighting changes in fast motion. Selected clips: includes all the selected clips of colourists that were selected using command click. It can also work upon 16 clips at a time. This feature is highly useful for determining inconsistencies but works with those clips that cannot be placed in the same clip. Neighbour clips: it can be accessed directly without grouping or clicking. It helps to show current clip, on which editor is working, in the left corner at lower side of screen. The previous clip of process will be observed in top position whereas next clip of this sequence stays on lower right corner. When these connected images appear on the screen continuously then they help users to make better decisions about light changes and generate perfect tuning between all clips. This feature is highly useful if you are working with locked cut instead if grading dailies. Gallery Grades : it helps to compare present shot with gallery stills. It helps users to visualize so many editing options and their effects even without committing them on real time basis. Those who have bunch of the PowerGrades in arsenal can process wide collection to check what is best suited to current frame. 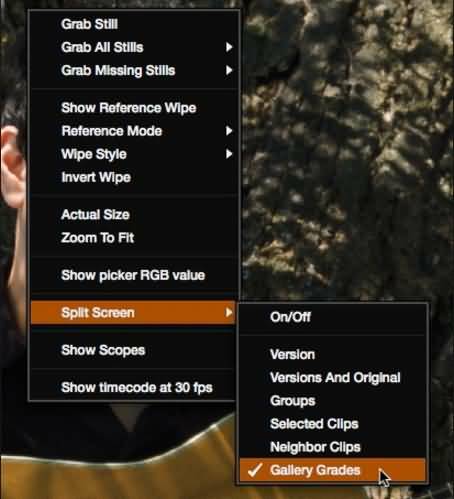 If you have already applied amazing grading options over shots and are not able to make decision for suitable grade for the next shot and Gallery Grades option can be useful for testing the grades in snap.